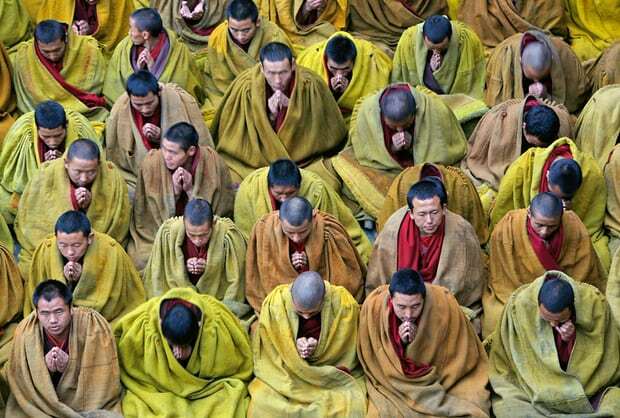 (TibetanReview.net, Mar24, 2018) – China said Mar 23 that it was testing monks in Tibet’s monasteries on their knowledge of Chinese constitution and regulation so as to test their patriotism and loyalty to the communist party state. China’s state and party mouthpiece globaltimes.cn, which reported on the programme, however, did not say what the consequence of failing the exam will be. It cited the official chinanews.com as reporting Mar 21 that Sera Monastery, one of three major monasteries in Tibet’s capital Lhasa, had conducted an examination on Mar 21 among its 400 monks. The exam was stated to have touched on China’s Constitution and regulations on religious affairs. Other monasteries in the region were stated to be conducting similar examinations in the near future. “Knowledge of the laws can make me a patriotic good monk, regulate my behaviour and help us better obey Buddhist commandments,” the report quoted a Sera monk named Ngawang as saying. He was also quoted as having learnt, “Theft, for example, not only violates the law, but also breaks the … temple’s regulation” as well as Buddhist precepts. The report cited Xiong Kunxin, a professor at Tibet University in Lhasa, as saying that some Buddhists commit crimes because they did not know they were breaking the law or the legal consequences of their actions. The report noted that the Tibet regional government had issued multiple regulations related to Tibetan Buddhism in recent years, including a regulation that oversees religious activity venues, to provide support to a sustainable management mechanism toward Tibetan Buddhism. The report also cited Tashi Gyaltsen, a party official in Qiongjie (Tibetan: Chonggye) County of Shannan (Lhokha) prefecture as saying officials in the county were expected to study the Constitution of China, which was amended and approved on Mar 11, at every local village. The report said Tibet (ie, Tibet Autonomous Region) had 1,787 different types of sites for religious activities, 46,000 monks and nuns and 358 ‘Living Buddhas’ by 2015, official figures which have remained unchanged over many years despite reports about closure of monasteries in Nagchu Prefecture and expulsion of monks nuns over the past several years.